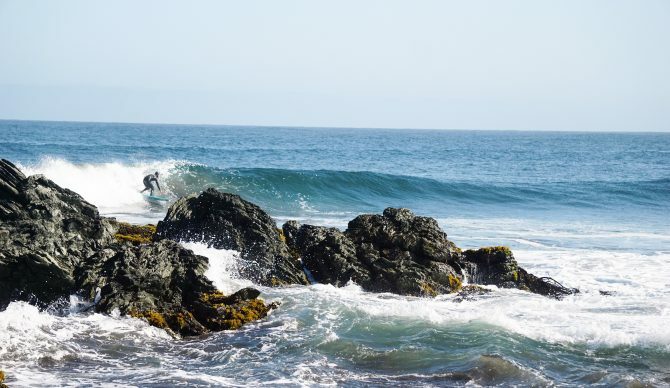 I’d wanted to take my family down to the rugged coast of Chile for a long time, and as husband and wife goofy footers, Pichilemu/Punta De Lobos always seemed like a perfect destination to get some serious surfing in. We also wanted to provide a fun and culturally enriched experience for our three kids. We hadn’t heard of many families going on surf trips to Chile, so we decided an extended paternity leave after the birth of our now three-month-old would be a cool opportunity to give it a try. Chile is a very unique place. It is rugged, harsh, raw, but very beautiful. Even in March, the warmest month of the year, the water is incredibly cold. Also, jumping off the rocks into the lineup on a big day rivals anything I have encountered for sketchy experiences in surf. The currents are among the strongest I have ever encountered, especially on the big days and on low tide. And in spite of all this, the waves are some of the most consistent I’ve seen in the world, making it all worth the effort. We made our trip during Chile’s offseason and found the locals saying they wouldn’t bother surfing most days because it was too small. Funny enough, the smallest day was overhead and rippable, with a couple days sprinkled in of double-overhead perfection. I quickly forgot I was wrapped from head to toe in rubber, scoring 45-second long lefts all the way down the point and into the bay. There’s a perception that Chile isn’t a very family friendly destination, so my wife and I set out to disprove that notion. We wanted to have an authentic experience so we stayed in the Pichilemu Domos, which are rustic cabins with dome roofs. The structures complemented the unique landscape. Staying in and around that area also provided an awesome cultural experience for the kids as well. We also stayed at a Conviento De Lobos (which was right on the point at Punta De Lobos) where we’d see horses and alpaca walking through the property whenever we woke up to go surf. It was everything I had imagined about Chile. The kids were stoked on the unique animals and my wife and I were stoked on the perfect lefts. While most of our family vacations have a good balance between surf and exploration, this one focused heavily on surfing. The kids were still able to run around the beach and tide pools all day while we took turns surfing and watching the baby. So all in all, we accomplished our goal of taking the kids to a unique, semi-remote, off-the-beaten-path destination with really good waves. While we prefer surfing in board shorts and bikinis, the wave quality and consistency made it worth bringing all of the extra rubber. Chile was a great experience, not only for us as parents, but for the kids as well. It was clean and safe enough for our three-month-old and we were able to enjoy the uniqueness of the culture and landscape while taking turns getting perfect lefts. Editor’s Note: You can follow the Denning family’s travels on Instagram here.